Rate this project Stanislav Hoferek has announced the release of Greenie Linux 7.1L, an Ubuntu-based, user-friendly desktop distribution optimised for home users in Slovakia and Czech Republic (English is also supported): "Another Greenie Linux release is here. Greenie 7.1L is based on Ubuntu 10.04 LTS. What is new? Graphical design was replaced by our own theme called GreenieTree, new icons, new wallpapers. Newly added and re-added applications (Ufraw for editing RAW images, Fotoxx as an additional graphic editor and WINE for running Windows applications). Also, all upstream updates are included and a few bug fixes and additional translations are now also on the CD." Here is the brief release announcement. Download the live CD image from here: greenie-7.1l.iso (700MB, MD5). Greenie Linux is a Slovak desktop distribution based on Ubuntu MATE and optimised for users in Slovakia and the Czech Republic. The project's latest version is Greenie Linux 18.04. "The new version of the Greenie operating system is here. Greenie 18.04 is based on Ubuntu MATE 18.04 LTS. Kernel 4.15, LibreOffice 6, GIMP 2.10, MATE 1.20 and much more packages are included. A good selection of programs will allow beginners to use this system immediately. It includes the OpenTTD game (including expansion packs), terminal tools and aliases, add-on fonts or pre-installed WINE. As opposed to Ubuntu MATE, the system is cleared from language packs, fonts, or documentation in languages that are useless for users in Slovakia, Czech Republic or Poland." Further details can be found in the rest of the release announcement, which is written in Slovak (an English translation is included at the bottom of the page). Download (MD5): greenie-18.04-desktop.iso (1,539MB, torrent, pkglist). Stanislav Hoferek has announced the release of Greenie Linux 16.04, a Lubuntu-based desktop distribution optimised primarily for Slovak and Czech users, but also supporting English, Hungarian and Polish languages: "Greenie Linux 16.04 is here. There are two editions. "Lite" is a useful system for everyday use with only the most important packages included, while "Desktop" has many more useful applications. For example, the newest WINE, LibreOffice, GIMP and many others. Greenie is based on Lubuntu, so it works fast even on older hardware. Specific Greenie applications are included, as well as applications for Windows that might be very useful for dual-boot setups. Greenie 16.04 is provided as an installable live medium, especially made for users in Slovakia and Czech Republic." Read the rest of the release announcement (in Slovak, scroll down for an introduction in English) for further details and MD5 checksums. Download (MD5) from SourceForge: greenie-16.04-desktop.iso (1,229MB), greenie-16.04-lite.iso (903MB). Stanislav Hoferek has announced the release of Greenie Linux 14.04.1, a Lubuntu-based desktop Linux distribution with special focus and tools designed for book writers: "Greenie, a Slovak/Czech distribution based on Ubuntu (okay, this time on Lubuntu) is back. At approximately 1 GB it uses Linux kernel 3.13, the LXDE environment, a few common programs (VLC, Firefox, etc) and of course those programs which are the reason this system was built for. The new Greenie, named internally as 'MoReWrite' which is a strange acronym for 'Modify, Read and Write', focuses mostly on ebooks and documents. If you read, edit, write, translate or convert books, all the necessary tools are on this single medium. We can mention the LibreOffice suite, PDF viewers (including programs for editing PDF), programs for undisturbed writing, tools for converting various kinds of ebooks, and everything for production of ebooks, such as creating cover and formatting." Here is the full release announcement with a screenshot. Download (MD5): greenie-ebook-14.04.1-dvd.iso (934MB). 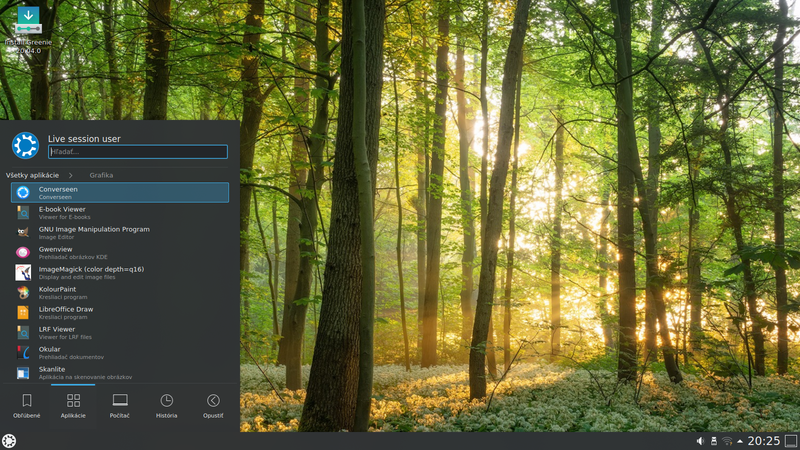 Stanislav Hoferek has announced the release of Greenie Linux 9N, a beginner-friendly Ubuntu-based distribution with enhanced support for Slovak and Czech languages and extra software applications: "Greenie Linux 9N is finally here! Based on Ubuntu 11.04, Greenie uses the classic and solid GNOME 2.32.1 instead of GNOME 3 or Unity. Several new applications (FBReader, gToDo, Adobe Reader, Audacity), new versions of Firefox and all other software, and new, much darker artwork, are now in Greenie. Also we made it possible to run popular websites (Facebook, Twitter, Pastebin, YouTube, etc.) using the Run dialog. This version will come in both 32-bit and 64-bit flavours, and the 64-bit edition will be announced very soon." Read the release announcement (in Slovak, except for a brief English note at the bottom) for a detailed list of changes and new features. Download: greenie-9n-x86.iso (1,123MB, MD5). Stanislav Hoferek has announced the release of Greenie Linux 8.1M, an easy-to-use Ubuntu-based distribution pre-configured for use by Slovak and Czech speakers: "Another version of Greenie Linux, an operating system prepared especially for Ubuntu lovers in Slovakia and the Czech Republic, is here. 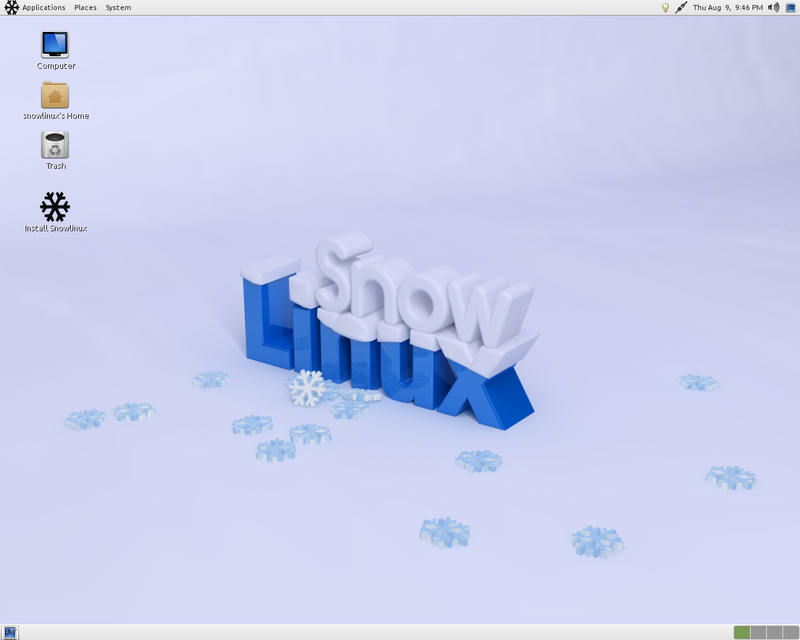 Among the new features, a few applications were added to the Linux distribution (e.g. programs for manipulating PDF files, to see the temperature in console, and to download entire websites) and some useful programs for those who dual boot with Windows (e.g. software for CD/DVD burning and for reading ext4 partitions) were added to the DVD image. A few problems have been fixed, new wallpapers and documentation (especially about digital photography) added. The system is actualised with the newest software in the Ubuntu 'Maverick' branch." Read the rest of the release announcement (mostly in Slovak, with a brief English summary at the bottom of the page). Download: greenie-8.1m.iso (1,008MB, MD5). Stanislav Hoferek has announced the release of Greenie Linux 8M, an Ubuntu-based desktop distribution optimised for Slovak and Czech-speaking users: "One month after the release of Ubuntu 10.10, a new release of Greenie has arrived. What is new? From this point on, Greenie Linux is primarily a DVD, as it is no longer possible to fit it onto a CD. Among the more interesting programs included in the release are Google Chromium, GIMP, Pidgin, VLC, Moovida, Pingus, WINE, OpenTTD and many other applications and games. Greenie Center was re-built, new theme (Deepin) is used. Work from inside VirtualBox is much better, documentation was updated a bit and there is also better support for languages other than Slovak and Czech." Read the rest of the release announcement (mostly in Slovak, scroll to the bottom of the page for the brief English version). Download the live DVD image from here: greenie-8m.iso (998MB, MD5). Stanislav Hoferek has announced the release of Greenie Linux 7L, a user-friendly, Ubuntu-based distribution designed primarily for Slovak and Czech speakers: "The seventh major version of Greenie Linux, an Ubuntu derivative for (primarily) Slovak and Czech users, is available for free download. What is new? New logo, new versions of software applications (like current Ubuntu, but updated with all official updates), much simpler look with all Greenie-specific features added to the Applications menu, new and useful applications (PiTiVi, Ailurus, Tucan, Bluefish). Also, many dropped applications from Ubuntu (Pidgin, GIMP, Glchess) are included in Greenie. Improved Greenie center, more Bash aliases and many other improvements. Special thanks for DuÅ¡an HalickÃœ, who helped a lot with the new concept." Here is the complete release announcement (in Slovak, scroll down for a brief English summary). Download: greenie-7l-final.iso (680MB, MD5). Stanislav Hoferek has announced the release of Greenie Linux 6K, an Ubuntu-based desktop distribution optimised for Slovak and Czech users: "Greenie 6K is based on Ubuntu 9.10 'Karmic Koala', with many up-to-date applications, including Linux Kernel 2.6.31, GNOME 2.28, OpenOffice.org 3.1.1, Firefox 3.5, WINE 1.1.33 and also some new applications, such as Google Chrome (web browser), Imagination (slideshow creator), PDFMod (PDF editor), StarDict (a dictionary with support for Czech), Empathy (Internet messaging client, Pidgin is included too). Because of lack of free space on CD, several programs have been removed, including Inkscape, Alien and Mencoder. Greenie 6K also brings several changes to Greenie Toolbar, Firefox (with new speed dial), Bash aliases and graphic theme." Here is the brief release announcement. Download the installable live CD image from here: greenie-6k.iso (698MB, MD5).